An enchanting valley and an unforgettable stay. Only 35 minutes from Marrakesh’s airport, the Kasbah Bab Ourika rises majestically at the top of the Ourika Valley, guarding the entrance of the Atlas mountain range and dazzling guests with panoramic views of the mountains and the river that runs through the valley. Built with ecological considerations and using old Berber techniques, this small hotel in earth tones and traditional thick walls seems to have grown out of the rocks, integrating itself perfectly in the dramatic landscape that surrounds it. During your stay you can relax next to the concealed swimming pool, in the rooms with a chic and rustic atmosphere with comfortable fireplaces, in the broad rooms with terraces or while experiencing a massage in the gardens. The chef is a specialist in Berber traditional recipes, but also in international cuisine, and uses the freshest ingredients supplied daily by the small surrounding villages. You'll be able to delight yourself with his dishes in the restaurant, in the gardens or even in the privacy of your room. For those who wish to see more of Morocco we suggest a visit to the Berber big market in the town of Tnine Ourika and to the farms that supply herbs and flowers to the herbariums and perfumers, without missing the discovery of the Medina souks of Marrakesh. The more energetic traveler will also want to experience an endless number of adventure sports, advised by the hotel's friendly and professional team. Marrakesh - Abd el Moumen Bem Plaza, Jemaa El-Fna Plaza, Les Jardins Majorelles (property of Yves Saint Laurent), Menara Garden, Souks (popular handicraft markets). Follow the Ourika road South of Marrakesh. After 38 km, turn left towards Ait Ourir and Tnine Ourika (known as Lundi). Follow this road until the end of the village and cross the river (there is a post office to your right after the bridge). This road curves to the right and after to the left. About 500 m ahead you will find a sign indicating curves and immediately after there is an earth road to the right (with the direction to where you came from). 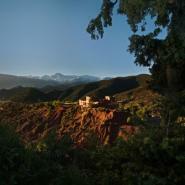 Follow that road and the indications to Kasbah Bab Ourika.